Hi everyone! I know you think I have disappeared! After the anniversary, my mother was scheduled for back surgery. Although it went very well, I have been trying to help them out as much as possible, so I'm sure you understand why I have not gotten around to you all yet! I am thankful she is next door and I can be available when they need me. She is doing really well, but will still need another 4-5 weeks for recovery. I do have some changes to show you that I made a few weeks ago. After Christmas, I had kept a lot of red, warm accessories in the living room. Then, I really just needed a change, so I pretty much changed everything out and decided to use my blue and white transferware throughout the room, which I'll show later this week. I also changed out some of the more Spanish accessories for a little bit of "Southern." The inspiration for this was a vintage handkerchief belonging to one of my relatives. Since the handkerchief is from 1872, I brought in a Mort Kunstler signed print titled, "Blessing of the Sword" from my collection. I thought the colors coordinated so well. I brought in some gold to go with the blue. 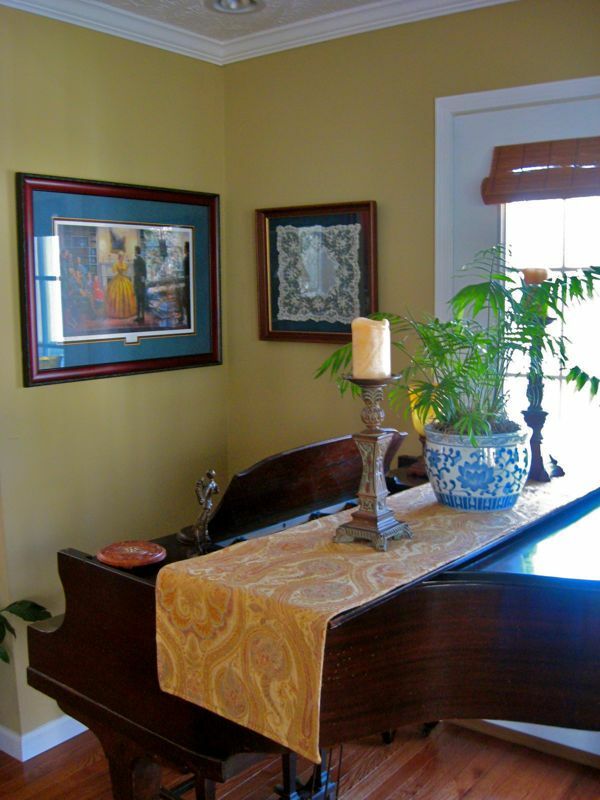 The paisley runner is one I made for the dining table, but it works nicely here on the piano. The palm tree gives us a little bit of that "Savannah" feel. I've seen that a lot in old southern houses. This is such a treasure to me and I hope it will be to one of my children. Now let me show you the before. It's definitely a different feel! I'm enjoying the change, although I don't typically change things a lot. When I do, I end up seeing an earlier photo and going back to that. It's fine for now, though. 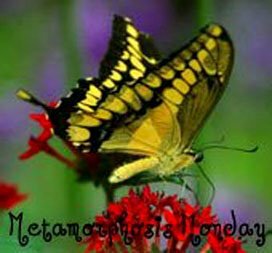 I'll be participating in Metamorphosis Monday over at Between Naps on the Porch, and Blue Monday at Smiling Sally, so be sure to go by there! If you gave me your opinion about the three coffee pots I was trying to choose from, you will be very surprised with the outcome! I'll show you as soon as I can:-) There was a very unexpected turn...you will never guess. Hi Anita! I'm so sorry your mother had to go through this but am so glad she's doing well. How nice you're so close to be of help. Now I like your change and the runner on your piano is so nice. I'd never thought of doing this! That's a wonderful painting too! I hope your mother is getting better after her surgery! Your home looks wonderful with all the new changes Anita! We have missed you! HELLO ANITA, I WILL KEEP YOUR DEAR MOM IN MY PRAYERS!! I LOVE THE CHANGES YOU HAVE MADE :) ITS JUST BEAUTIFUL!! That handkerchief is gorgeous! I have so many of my nannies and I love them. Hi Anita...wishing your Mom a very speedy recovery. I love your change. It is very different, but it is also very meaningful, which I love. Hi Anita, Bleesings for a speedy recovery for your Mother. What a blessing also to live next door. Love your classy and elegant display of your family heirlooms. I love lace and the hankerchief is just stunning!The runner you made is so beautiful. You are definetly continuing your family's tradition of creating warm and gorgeous timeless heirlooms and memories. Take care and many blessings, Emelia. Anita, So bright and cheery, love the changes, prayers for your Mother, and It's good to see you, again. I had spinal surgery and was bedridden for 6 months! So, I feel for your mom; thank goodness she has you close by. I love those blue and white transferware. It really draws the eye. 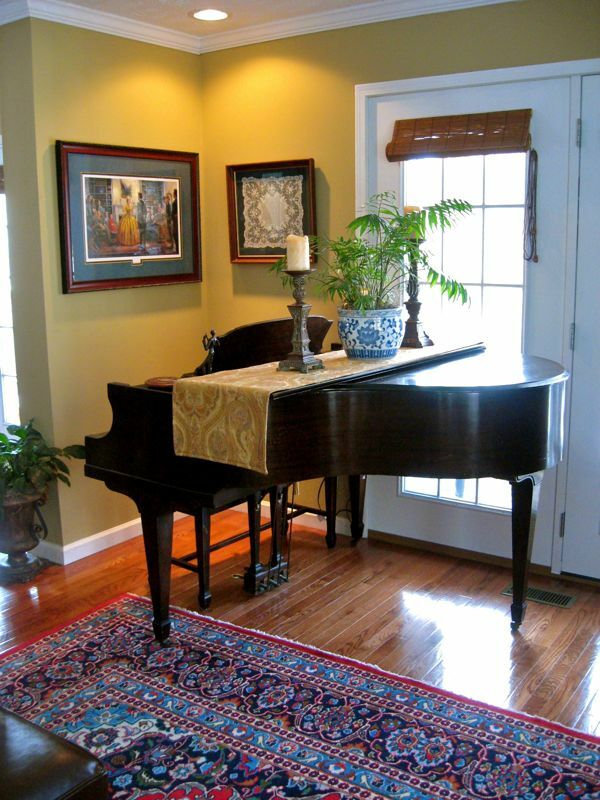 your piano is so beautiful--and uncluttered! i wish mine would stay CLEARED. i really like the "1872" look. VERY pretty! Hi Anita, I hope your mother is getting better after her surgery. How beautiful it all looks I love the handkerchief.Take care and many blessings. Huge change, but I sort of like the lighter feel for spring. And the handkechief is such a great momento. I have a whole box of hankies from the 40's I think. You've reminded me to pull them out and do something pretty with them. Such a beautiful area to change out. That handkerchief was lovely. I hope your mother continues to improve. 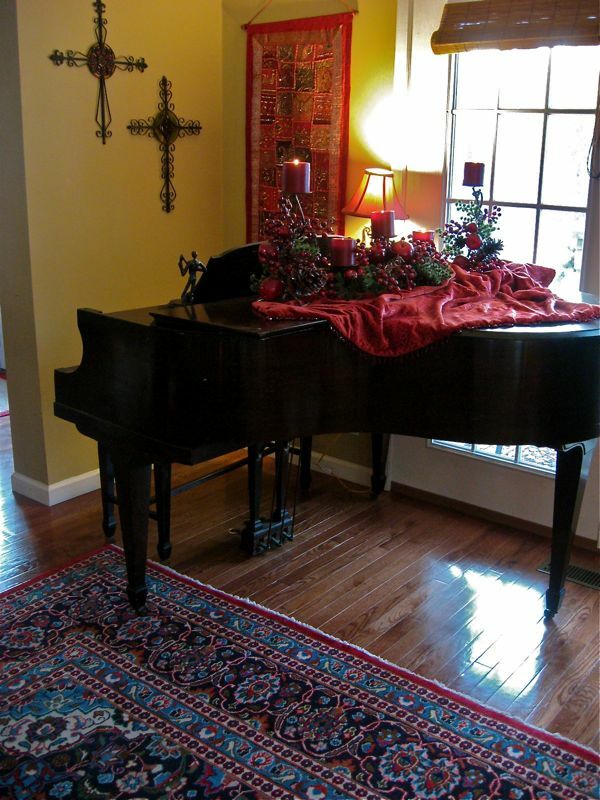 I miss the baby grand that was in our home while I was growing up. It needed a total reworking, so Mom sold it when she was moving. We didn't have room for it at the time. Love the handkerchief and the story. 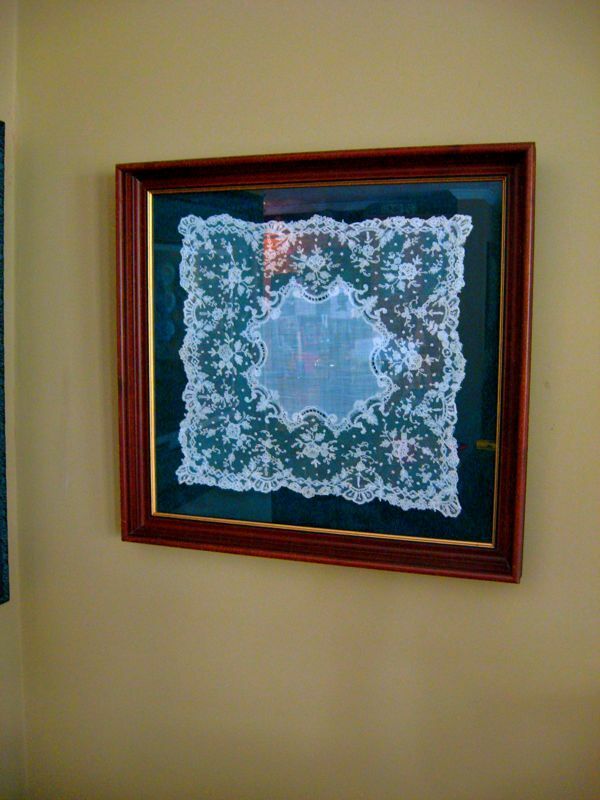 I have about a dozen of my two grandmother's and great grandmother's hankies and pulled lace linen pieces framed between two pieces of glass. Love seeing them. Dropping by from Met Monday. Hope you'll come see the dollhouse repurposed as laundry room shelf. Anita, I just love the way you decorate with things that are meaningful to you, and not just "store stuff"! The hankie is exquisite! Tell your mom that we are all out here pulling for her and I hope she will let you spoil her during this time..that's what daughters are for, right? Happy day to you both! 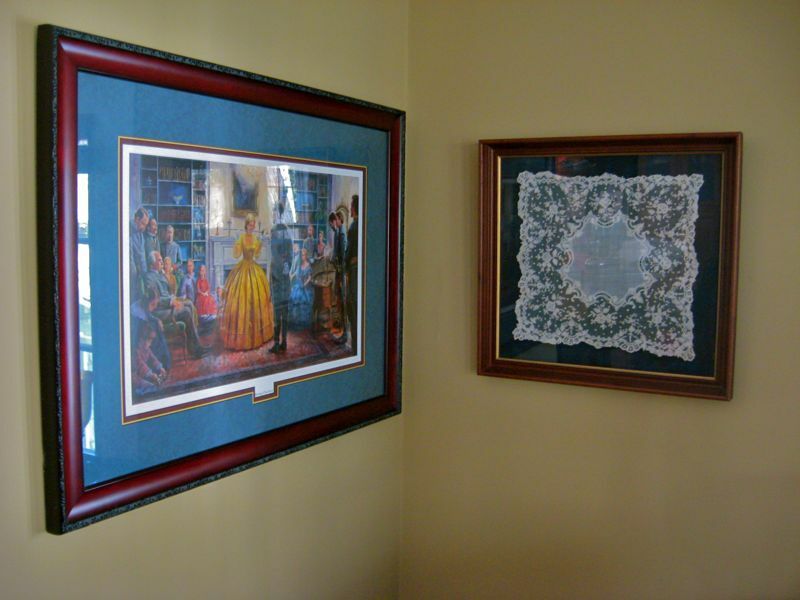 I'm so glad I came by this blog and read about your framing of a relative's handkerchief. 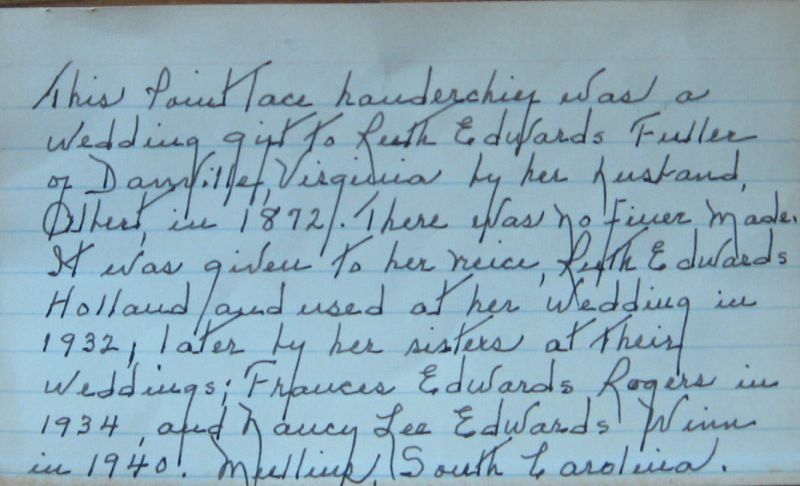 I have one of my grandmother's lace hankies that is over 40 years old stuffed in a drawer ... now I know what to do with it... Also, of interest to me is that one of your ancestor's married someone with my maiden name, "Winn." Praying for a speedy recovery for you mom! What a blessing that you are so close! That handkerchief is fantastic and the print just goes with it. It makes that corner look so bright and cheery! 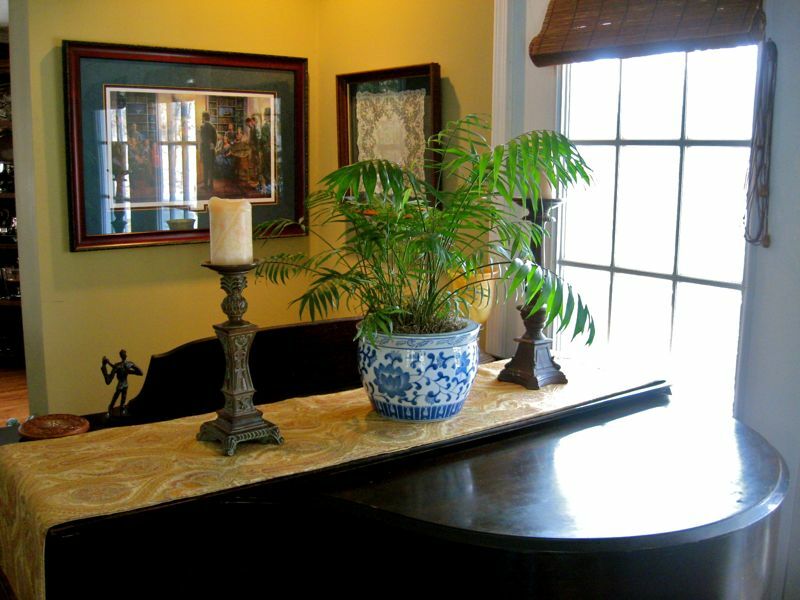 The palm is perfect for the southern feel! Everything just brightened and lightened up that corner! So pretty! I have something for you at LazyonLoblolly. Hi Anita! 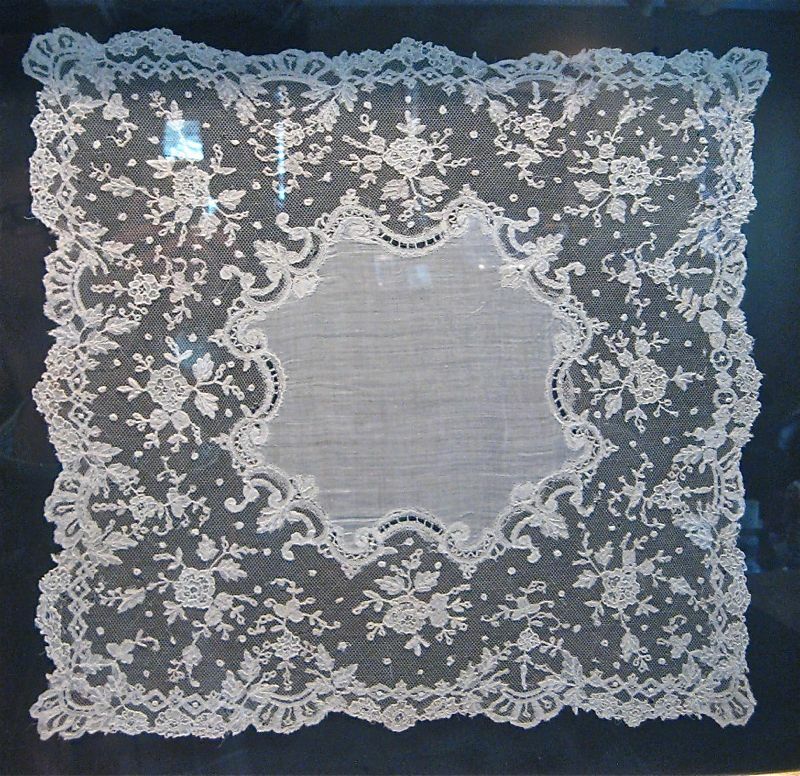 I haven't been able to type lately cause I've been in and out of the hospital with Dad, but I have been able to stop by once in a while Love both decors, but you know I am partial to the beautiful lace hankie. Can't wait for your Mountain spring pics!